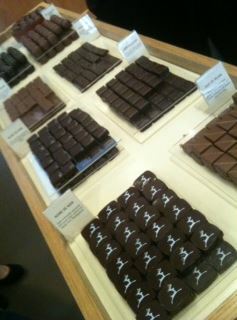 I love Maison du Chocolat chocolates. 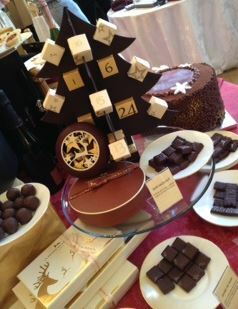 I enjoy the Valrhona blends they are made with, the flavours they create and the innovative holiday figures. This Christmas is no exception with absolutely gorgeous chocolates created especially for the season along with a magnificent sculpture, captured in miniature. Duo of pears: pears and milk chocolate ganache. I actually quite liked this. I think because there was still ganache in the chocolate paired with the pear it made it super yummy. I also like that the flavours are never too strong. Noire de Noir: pure origin dark chocolate from Madagascar. Now this I loved and had to savour a few at the tasting I attended. I’m embarrassed to say Indulged in three and they were all delicious. The flavours were quite pure and I loved the way that hint of fruit came through without anything added. I’d buy a box of just these and Blanc de Noir. 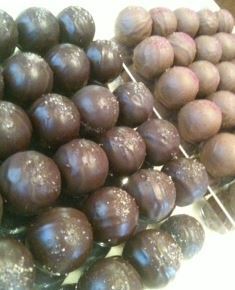 Blanc de Noir: dark chocolate ganache with Champagne Blanc de Noir. Now, I’m a girl who loves champagne and I can say that there is a hint to this chocolate but I’d eat these before the noir de noir as the flavour is subtle. One of the things I like about Maison du Chocolat is that they have subtle flavours and that means they have wide appeal. Nougat Dark & Nougat Creamy: fine layers of nougat enrobed in dark or milk chocolate. These were both delightful but again I’m not a nougat lover. However for a nougat lover, this is though to be a melt-in-the-mouth delight. Absolutely special. My favourite affordable piece though? I am absolutely in love with the Reindeer. 12 cm in diameter this piece is made entirely by hand. 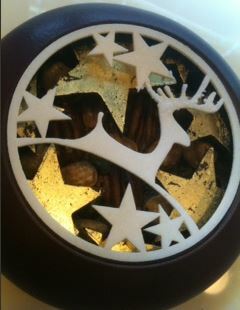 There is a dark chocolate pendant, a latticework of reindeer and chiselled stars in white chocolate, an open disk with stars in dark chocolate covered in gold leaf, then crunchy roasted nuts of mendiant (almonds from Valencia, pistachios from Sicily, hazelnuts from piedmont, pecans, chocolate beads). How could you eat this piece? That is crazy – this is just too beautiful and yet, how could you not as it is a delightful chocolate creation. Overall I am enchanted by this collection. While it may not be 100% to my taste, everyone has different tastes. I do absolutely love the reindeer creation and the noir de noir and the blanc de noir though and of course there is something in this collection for everyone. Why not indulge yourself?